Born in London, Jetsunma Tenzin Palmo left England at the age of twenty for India, and worked as an English teacher with Tibetan refugees. There in 1964 she met her Tibetan master, His Eminence Khamtrul Rinpoche of the Drukpa Kagyupa Lineage. Soon she got ordained and wa s one of the first Westerners to become a nun in the Tibetan Buddhist tradition. After studying for several years with her teacher, she was sent to the Himalayan valley of Lahaul to undertake more intensive practices. For another six years, Jetsunma practiced in a small monastery. Seeking more seclusion and better conditions to meditate, Jetsunma found a cave where she stayed for twelve years in retreat. She left India in 1988 and went to live in Italy, where she taught at various Dharma centres and monasteries. 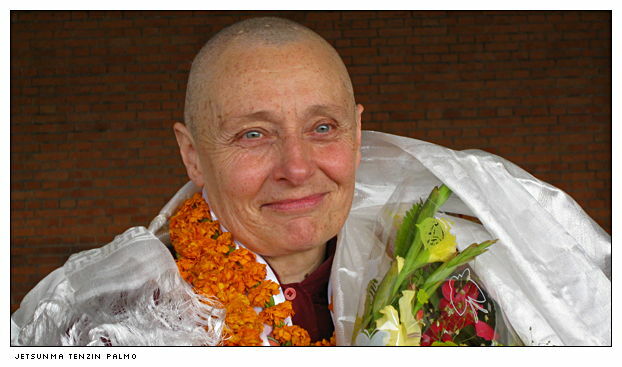 In 2001 Jetsunma Tenzin Palmo went back to India to fulfill the wish of her teacher to construct a nunnery for young women from the Himalayan region. She was given the title of Jetsunma, which means Venerable Master, by His Holiness the Twelfth Gyalwang Drukpa, Head of the Drukpa Kagyu lineage on his birthday 16th February 2008. Now, in 2008, the Dongyu Gatsal Ling Nunnery near Tashi Jong is almost finished. The temple is being constructed and there are about 60 nuns studying, practicing and meditating there. Five of them have started a long-term retreat.